Blueberry Picking Season begins the first week of July through Labor Day Weekend. Join our mailing list to receive an e-mail message when the first blues are ready! If you still want to receive a post card, just let us know and we will add you to our US Postal service mailing list. Hours also depend on the weather (for example, if it is raining, we may close). Please call us at 401-934-0741 (Harmony) OR 401-934-1413 (Barden), or send us a message on Facebook before you visit! We do also have a "pre-pay" system. $4 per adult (about 1.15 lbs) and $2 per child ages 6-12 (about 0.5 lbs) to enter the patch. This pre-pay is then deducted from the cost of the berries, as long as you pick enough to cover it. If you pick less than that, it is just a minimum fee to enter the patch for a snack. See our FAQ’s page for more information. Special Pricing for repeat customers!! If you are a customer who comes frequently, our loyalty program ensures that you get the lowest price every time you come. Once you have picked 10 pounds of berries, you can become a loyalty program member. We will charge you $3.25/lb every time you come in. Just come in with your container, tell us that you are a member, we’ll pull your card, and you can go out and pick! 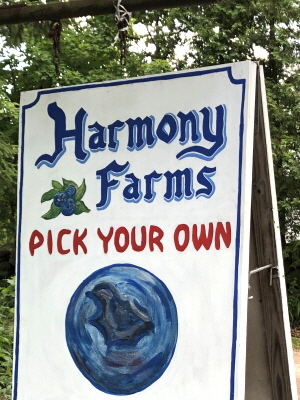 © Copyright Harmony Farms. All rights reserved.